Even mad scientists need love. In A Collection of Shiny Objects The Mad Scientist’s Guide to Romance, Robots, and Soul-Crushing Loneliness, comes a musical comedy that is sci-fi cute and romcom fun. With a book by Megan Sass, story by Sass and Jesse Geiger, and music and lyrics by Nathan Leigh and Sass, the musical comedy follows super genius scientist Emily as we learn a little bit about her super experiment where she will implant a chip in her and her boyfriend’s brain so they can literally share the same brain. When her boyfriend Chad catches wind of her plan, he decides to leave. Cue the loneliness and depression. So what is a mad scientist to do? Build a better boyfriend! 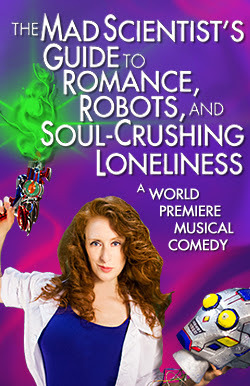 The Mad Scientist’s Guide to Romance, Robots, and Soul-Crushing Loneliness is a smartly written and fun musical. With a electronic midi scored, Sass, who plays the titular role, and company look like they’re having nothing but fun. The overall concept is cute and the writing strong. Sass layers in some wonderful pop culture references that influenced the show. Obviously some were overt and some went over the heads of the audience. Like the Rocky Horror and “Sword of Damocles” melody riff. With the writing witty, the structure was a bit off. The musical began with Sass addressing the audience but once the plot was established, the direct address style was a bit forgotten. The action that occurred may not have happened with said audience in view. The direct address presentation is a smart idea and would benefit from being explored further. Make fun of the hilarity of the situation. Sass took on the titular character. Sass is surely sassy. Yet she has this Billy Nye the Science Guy energy. Her conviction to science is captivating. Like children watching Bill Nye, you may not have understood everything she was say, but you bought it. Every mad scientist needs a lab assistant and Piper Goodeve as Maddy, the mutilated zombie, was quite incredible. Goodeve created a crazy character that was filled with heart. Her undying love for Emily was beautiful. Darren Bluestone as Chad and robot boyfriend Chad 2.0 brought the charm. Bluestone is the epitome of perfect boyfriend. When he transformed into Chad 2.0, it was a bit odd to not go on full robotic movement. Bethany Fay as dumb blonde and uber naïve Stephanie played the dumb card well. It added to the comedy. Director Jesse Geiger kept everything simple and smooth. Presented at a concert hall may have put a wrench into his creation, but Geiger allowed it to work to the productions advantage. The video design by Lianne Arnold was cute and colorful, evoking a very cheap budget feel. And yet it somehow managed to work. It was a bit of a disappointment to keep the music to a recording but the ensemble and music director Andy Evan Cohen clearly made sure there was no dead air moments. The Mad Scientist’s Guide to Romance, Robots, and Soul-Crushing Loneliness is cute and colorful and fun. But there was a little spark that was missing. Some connectivity cable. Perhaps with a bit more polishing, it may go somewhere.